What You Should Have Had On Spring Break! Many college students are belligerently roaming around party animal infested beaches enjoying their spring break. After a day or night full of drinking, what can be more handy than a personal smartphone attachable breathalyzer? Probably a Rate-A-Chick picture application would be, BUT second best is this Breathometer! 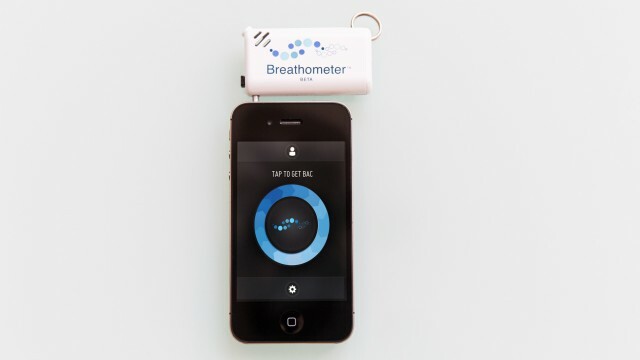 The Breathometer attaches to any smartphone via headphone jack. There is also a corresponding application that you download to control the device. All you have to do is tap the circle and blow directly into the meter and your blood alcohol content (BAC) shows up on the screen! And if that isn’t cool enough, the app then searches for transportation services nearby to insure a safe ride home. For a mear $20 you can get this nifty keychain size Breathometer and never be worried about driving again!